Easter is almost upon us, and soon the legendary Easter Bunny will make its annual Sunday morning appearance, delivering chocolate, candy, and toys, and (of course) hiding Easter eggs. The Easter Bunny, or Easter Rabbit, is certainly the most well-known secular symbol of this Christian holiday. But how did this beloved animal become so deeply ingrained in the celebration of Easter? No one really knows how this rabbit of antiquity morphed into the Easter Bunny we know and love today. Research suggests the legend of the Easter Bunny may have traveled to America with German immigrants in the 1700s. German traditions at the time upheld the tale of the egg-laying Osterhase or Oschter Haws (Easter hare) that appeared specifically for Easter. German children would create nests for this creature to lay its colored eggs. After German immigrants settled in Pennsylvania, the custom soon spread to other areas of the United States. The custom of decorating eggs for Easter Sunday may have begun as far back as the thirteenth century. In addition to its status as a symbol of new life, the egg was also on a list of prohibited foods—thought to date back to the fifth century—that Christians could not eat during Lent, the forty days of fasting and penance before Easter. In preparation for Easter, Christians during the 1200s began to come together to decorate the eggs they could eat again that Sunday. While eggs are no longer banned for modern observances of Lent, the practice of decorating eggs has since become a permanent fixture in Easter celebrations. Whatever its history may be, the myth of the Easter Bunny and its colorful eggs is fully ingrained in culture today. In fact, the Easter Bunny is such a mythical creature that even rabbit children are convinced their father could be this legendary figure! 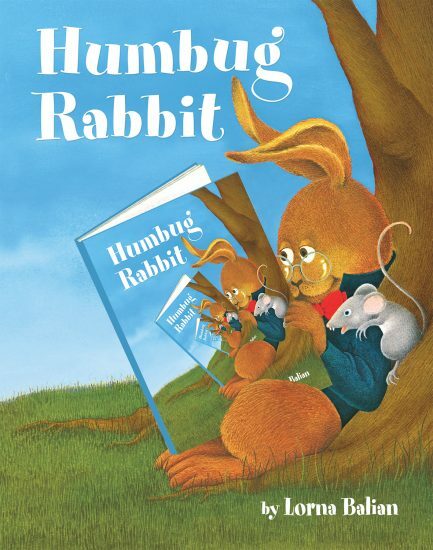 This scenario is exactly what occurs in Lorna Balian’s Humbug Rabbit: while Grandma prepares for Easter, five little rabbit children, who live below ground, learn the legend of the Easter Bunny for the first time and are quick to believe their own father is the culprit. Watch the two worlds meet in a joyous celebration of Easter! This entry was posted in Uncategorized on April 12, 2019 by Star Bright Books.